Home → eye health → Eye Nutrients Vital for Clear Vision! Over 65% of us experience eye strain symptoms. Over 65% of us experience eye strain symptoms. These are often caused by overexposure and glare from computer, TV and other technological devices. Research has shown that eye strain, or asthenopia, may be relieved by targeted eye antioxidants. 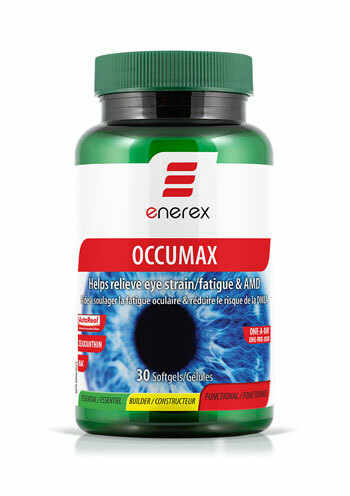 Enerex OCCUMAX includes the eye’s key nutrients Lutein and Zeaxanthin, in addition to Astaxanthin, Bilberry and N-Acetylcysteine (NAC). These are also clinically proven to increase eye health. Eye nutrients are, of course, found in foods, but may be easiest to obtain in high amounts in supplement form; and OCCUMAX offers them in a one-a-day formula. Lutein and Zeaxanthin are the predominant antioxidants found in the eye area vital to sight, the macula. Astaxanthin, the most powerful carotenoid, is clinically proven to reduce visual display terminal (VDT) fatigue. The well-known botanical sight-booster Bilberry, and far reaching NAC also help maintain optimal ocular function and reduce risks of age-related eye diseases.